For well over a century, SEMCOR has been providing reliable industrial product solutions to companies throughout Missouri, Kentucky, Indiana, Illinois, Iowa and the entire Midwest. Whether you need top-quality fluid handling products for everyday use or to resolve a specific fluid control problem, you can depend on SEMCOR. Few companies can match our remarkable combination of superior products, industry knowledge, fabrication capabilities and sincere commitment to providing timely, attentive customer service. Along with an articulated pipe system, swivel joints constitute an essential element of any loading arm system. 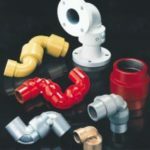 Swivel joints provide the flexibility that makes it possible for the rigid metal piping to safely and efficiently load and unload fluids and gases from storage tanks, without the need for bulky hose. Thus, swivel joints are viewed as standard equipment in all types of top, bottom and marine loading arm systems. SEMCOR offers a wide selection of versatile, dependable swivel joints from OPW Engineered Systems, a leading manufacturer of high-quality solutions designed for the safe handling and transport of hazardous bulk materials since 1892. We work closely with the team at OPW to ensure our customers receive prompt, reliable technical support whenever they need it. Please take a closer look at our current swivel joint offerings and feel free to contact us for additional product and pricing information.